The under desk bike has made its way into the grade school classrooms. It is being used as a learning tool and becoming just as commonplace as the seat and desk. 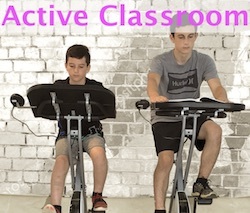 Welcome to the “Active Classroom” where students can move and work. Need a quote for your school? Best price guarantee! Contact us. The freedom to move is working well for children with many needs. 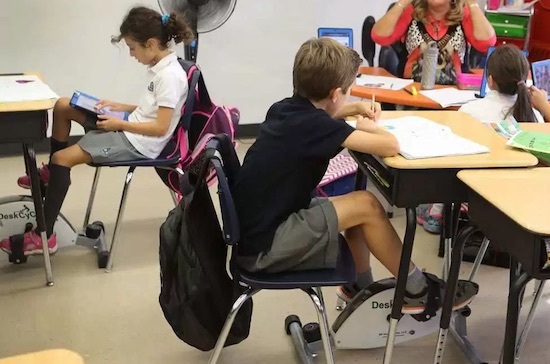 Whether they have been diagnosed with ADHD or need to fidget, incorporating pedals under the desk is helping classrooms become more productive all across the globe. 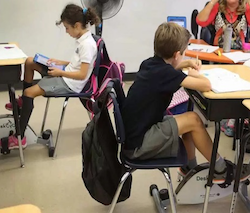 Many teachers know that students can pay more attention and learn better while limiting fidgeting by installing bicycle pedals under their desks. According to several students, the movement is a key to maintaining focus and staying alert. The teachers experience is the same. Although it may or may not be a substitution for pharmaceuticals being used by many to curb a child’s hyperactivity, pedalling while learning is proving itself to be a solution. What better than reducing the noise and movements in a classroom of 30 or more students just by installing a bike desk for the students. Kids are reporting they are learning better and able to focus. Teachers are reporting less disruption and an increase in productivity. It doesn’t take the kids long to adapt to pedalling and working and in short time the grades shoot up. These are just a few of the schools using the bike desks. purchased these bike desks to help children who find it difficult to keep still for an extended period. The pedal desks have already made their mark. One reason why the exercise helps with focus and concentration is the simple movement increases blood flow and oxygen supply. This helps to stay alert and interest. Another reason why pedalling helps is with students who find it difficult to sit still. Now they can move and work. These students are reaching higher levels of performance in their school work. 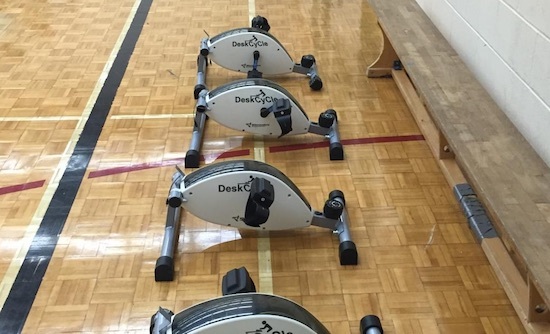 Students can sit to pedal on a DeskCycle in their own desk or use a desk bike. The teacher at the elementary school saw the need for having an active classroom. They kickstarted the Read and Ride Program. In some cases teachers will give passes to the kids who need to pedal and other schools have set the desk bikes up in a different area where kids will leave the classroom to use the bikes. 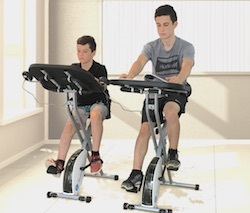 Children with DeskCycles at their desks are often assigned to their own DeskCycle. Other classrooms have been able to equipped the entire classroom with bike desks and DeskCycles so they don’t have to take turns. In either case the bikes are so quiet the teacher has no additional difficulty being heard because the bikes are so quiet. They can have 30 – 40 students all pedalling at the same time. As a matter of fact it is quieter to have 30 students pedalling than is is to have one or two fidgeting in their desks. Older students in college have also found benefit from the use of stationary cycling while studying. Just like reading a book on the stationary bike at the gym, the crossover of this habit of reading while pedalling is improved with the added desktable to the bike. Now the student can accomplish more school work and still pedal. 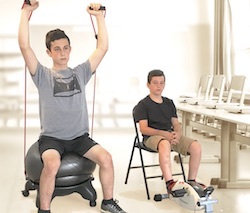 This classroom has chosen to replace their traditional school desks with active learning tools such as ball chairs and pedals. All across the nation students are being able to cope with behavioral issues using movement and touch. Now they are better able to hear instruction and learn. Teachers report the kids are more receptive and less disruptive. The answer seems to lie in the active learning tools. 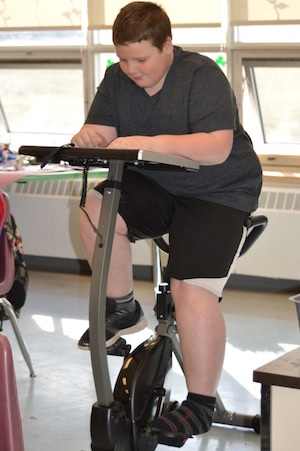 An overall consensus appears to be that bike desks for students cause a general increase in students’ performance and a decrease in student fidgeting in the classroom.